What do you mean by Any number is too many? Any number of people dying on our roads is too many. Our road toll is rising and our communities are suffering. We want everyone to recognise death on our roads is preventable and join us in saying Any number is too many. Our About page will tell you more. The number of people dying on Southern roads is increasing. If we keep doing the same thing to address road risk, we are going to keep seeing the same results. We are asking Southerners to join us in creating new solutions to road death and serious injuries in our communities. What does Any number is too many hope to achieve? We want Southerners to show they care about road deaths in their community. We want everyone to talk about how they can work to address road risk and road death. By saying we care, we can make a difference. We can increase our understanding of road risk and become part of the solution. Want to join us? Visit our Share your message page. Southland and Otago communities know they need to do something new to stop people dying on their roads, so they’ve come together to say Any number is too many. Right now the situation isn’t great. After years of a declining road toll, the number of deaths and serious injuries on Southland and Otago roads is increasing. Compared with the rest of the country, Southland and Otago have a high level of road risk. If everyone who cares about road risk gets involved with Any number is too many and contributes to the conversation, we will make a difference. As the conversation grows, other community members will feel more confident about voicing their concern and showing they care. They will know that there is a supportive community out there that is willing to take action on road risk. Want to know more? Head to our Share your message page. What can my community do? You can come together and talk about road risk. We will be holding official meetings but any conversation anywhere, any time will make a difference. You can also tell your Council about the risks you see and experience every day. You know your roads better than anyone else and often know what needs to be done to improve their safety. If you want to do more to support the programme, you can help us give communities a voice to talk about road risk. We will be organising better community conversations in Southland and Otago over the coming months. Please let us know if you would like to come along or are interested in helping us organise one in your community. 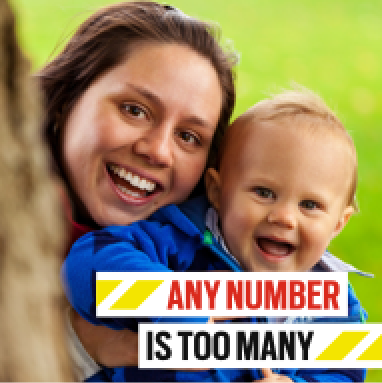 If you have any other ideas or would like to support Any number is too many, let us know by emailing us at hello@anynumberistoomany or comment on our Facebook page. How can I show my support for Any number is too many? You can show you care and want to make a difference with one of our stickers or posters. Put one on your car, in your workplace or at your school and encourage others to do the same. You can also like our Facebook page and share your story there or tell us why you think we need to make a difference. Find out more about sharing your message here.